Turnip roots are an excellent substitute for potatoes — but only if you roast them! 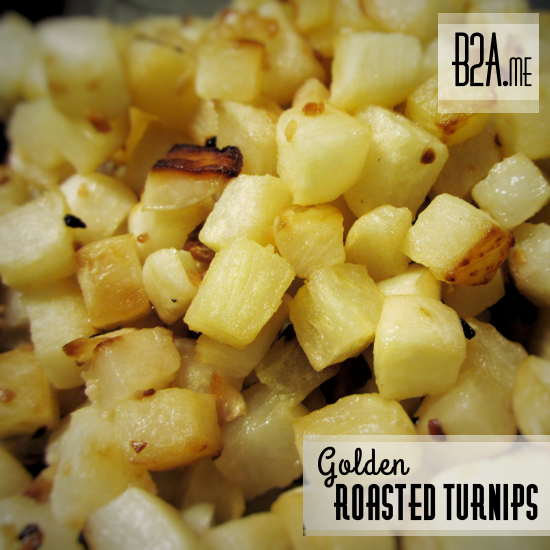 Turnip roots are an excellent replacement for starchy potatoes — if you roast them and caramelize their sugars! Roasted turnip roots have a little bit of a sweet and tart aftertaste, which I adore. The roasting process is essential for caramelizing the turnip sugars and mellowing out the turnip’s natural bitterness. In fact, turnips are 50% sugar! Fun Fact: Half of the kcals in turnips come from good ole natural sugars. But don’t worry, a cup of cooked turnips is a low-cal treat — providing only 30 kcals per cup! The recipe below calls for green onions to season the turnips, but I often swap the green onions for garlic and the result is equally delicious. An excellent substitute for potatoes! These lovely turnip roots have 36kcals per cup versus the whopping 120kcals provided by potatoes — a 70% kalorie savings. Peel turnips and slice into 1/2 inch cubes. Spread the butter and green onions over the raw turnips. Bake in oven for 60 minutes. Check on turnips every 10 minutes and use a spatula to move turnips around. This ensures they are evenly coated in butter and cook evenly. *If you haven't already, try European butter rather than the USA-made stuff. [Not European-style, that is a sub-par imitation.] The unique blend of dairy fats produced by European cows, munching on European grass, produces a taste that is UNRIVALED.